Mission of Motherhood by author Sally Clarkson is for moms who love their children with all of their heart, but have found themselves curled up under their covers, fighting back tears, and begging God for help. In Mission of Motherhood Sally shares her realistic experiences as she forged in the trenches of raising her own four children and how she found fresh vision for motherhood through God’s word. Re-discover the joy and fulfillment that can be found in the role to which God in all his wisdom has called you to. 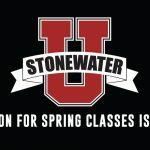 This class is a 12 week class on Tuesdays from 10:00-11:30am. Class begins on February 14th and costs $35.00.